We looked at momentum earlier in the month through the advance decline numbers. Using historical data, we saw that such intense thrusts usually continue far longer than most anticipate. Since then the S&P 500 is little changed. 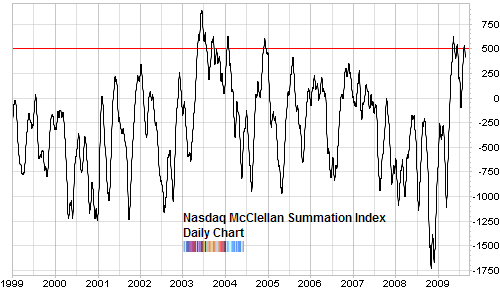 But the McClellan Summation Index continued to go up, even as the market’s rally was put on pause. It reached 1393 (see below for chart) higher than it had been since January 2004. 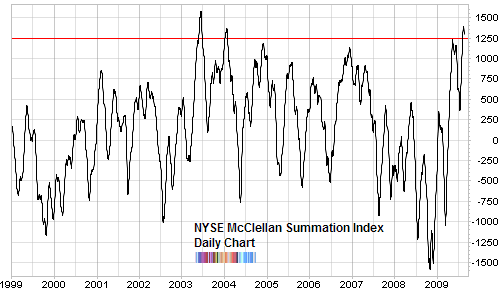 The McClellan Summation Index, is a long term measure of market breadth and right now it is saying that - at least in the short term - the stock market’s momentum has waned. While historically such extreme levels of momentum from the McClellan Summation indicator are followed by sideways trading or retracement, they do not normally hinder more long term moves. This dovetails with the sentiment data which we reviewed last week. I’m expecting the market to soften a bit and even give back a significant portion of the spring rally. But rather than detract from the ‘bottom’ thesis, this could help the bulls in the long term. One possibility is that we could settle into a nice wide trading range where peaks and valleys offer trading opportunities. Or perhaps by shaking off the weak hands that have become way too giddy, a correction would increase the longevity of this rally.